KuronaBags is a unique bag addon. It provides everything you normally expect, but has a unique twist. You have unlimited bag slots to work with! Well to be fair there Is a limit, but it's kinda high. In addition to having all the slots you could want to organize your junk, there's a few extras such as a built in search bar and a nice loot notification windows. Adjustable number of bag slots, up to hundreds of slots(you still can only carry what you bags allow, but you have space to move stuff around) This can be disabled for a basic bag experience. You can make additional bag windows seperate from the main one. You can even minimize them if you want them hidden. Sorting! You can specify search patterns for each of the new bags you create to have new items automatically show up in that bag. KuronaSalvage is included. its a modified version of the carbine salvage window but lets you Ignore items you never wish to salvage. AutoSort button: This button can be used to move any items in your main bag to the extra bags based on their search strings. Loot notification for when you get items or money. Works like IconLoot. Search bar! Easily find whatever items you want. Auto Repair / Auto Junk and AMPs toggles. Includes an Optional Quest item bag. Includes a basic bank and Tradeskill bag. Search the AH/CX/Tradeskill Schematics by shift+clicking and item in your bag. 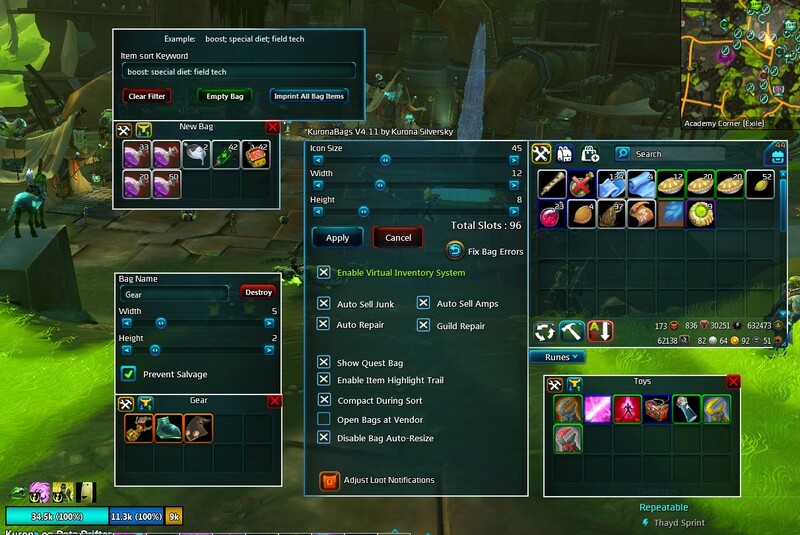 You can also disable the "Virtual Inventory System" in favor of a basic bag experience. It includes a few sorting methods and a Search function. The Bank API is a bit limited so I can't do anything really fancy yet. Still looking into it! Am I missing something, or will this not auto-sort within each virtual bag? I see the option to compact the items to the top of the bag when you sort, but I feel like everything that's left in each bag should probably be sorted by item type or alphabetical or whatever I choose. 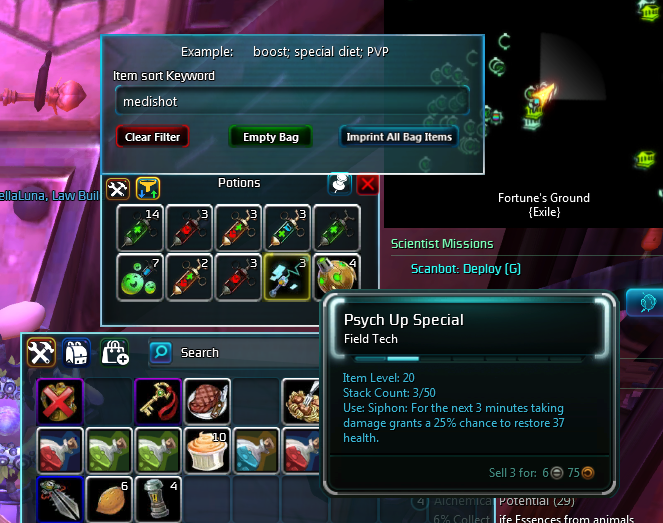 I've noticed that when adding the filter "medishot" for a virtual bag, it also added items labeled as "field tech" as you can see bellow. Is this working as intended? EDIT: Now it adds boosts as well. Just FYI: KuronaSatchel is still marked as API 13. How can i see how many Promissory Notes i have with this Addon? Would it be possible to get a way to set up the KuronaLoot portion without going through KuronaBags? 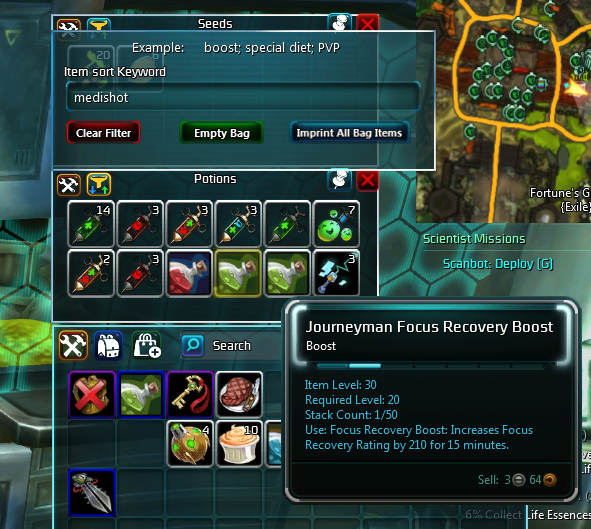 I love the loot popups and being able to customize them, but I'm more a fan of the ForgeUI inventory (no offense). With my current setup, I have to switch bag addons whenever I make or rename a character, or if I want to redo my UI. I made a stand alone KuronaLoot awhile back for people who just wanted that. It should still work if you tell the game to load out of date addons. Its something I would like to do but theres so many currencies displayed at the moment. not sure how to go about it yet. the Triploons are the most important thing! i'll check about the UI priority. I'm aware of the issues with transfering items from the bank but haven't time to correct it. Question, since API 13 the protostar promissory note are important, but there is no way to track these with your bags. Can you add them to the currency list? This might be tricky. I'll take a look at how they work if it's different than before. Yikes. Carbine just loves to break stuff. I'll take a look. PPet is now updated in v0.2a, do work. Nice addon - could you add the following features?